Boron nitride is a structural equivalent of carbon. It forms similar nano-morphologies: nanotubes, onions, ropes,… BN presents interesting characteristics for applications. In particular, BN is more chemically inert than carbon. For instance, it is stable against oxidation (up to 900C, when graphite burns at 600°C), which makes it a good candidate for high temperature applications. Also, BN presents higher polarity than carbon, possibly allowing better solubility. Although research on BN NT started parallely to research on carbon NT, the number of publications has kept lower of an order. On one hand, BN requires more energy in pre-development research, in particular for mass production, but on the other hand, patenting is more opened. Fig. 1 Similarities between h-BN (right) and graphite (left) The nearest neighbour distances (0.144 and 0.142 nm respectively) and the inter-layer spacings (c/2 = 0.33 and 0.335 nm) are almost identical. However, in h-BN hexagons of neighbouring planes are superposed (boron and nitrogen alternated along c axis), when they are shifted of half a hexagon in graphite. h-BN (Fig. 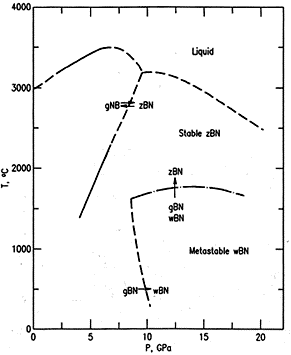 1) is a stable phase, although solid boron + nitrogen is clearly meta-stable. (A piece of boron under ambient air does not recombine.) The hexagonal phase of BN is very similar to graphite. (It is sometime called "white graphite", for its aspect.) Crystallographic parameters are almost equal (~ 1%). However, in h-BN, hexagons of neighbouring planes are superposed (B and N atoms in succession along c axis), when in graphite they are shifted of half a hexagon. igh-pressure phases of both materials (Fig. 2-3) have been intensively studied for their interest as ultra hard material. Both materials are stable in a dense cubic phase (c-BN and diamond), although BN also forms a metastable hexagonal phase, known as wurtzite-type. At high temperatures and high pressures (Fig. 2-3), both carbon and BN are reported as a “liquid” phase. Isotropic carbon phase is known to be dominated by molecules, mainly C2. It is not clear if there is liquid BN phase dominated by a stable BN molecule. The transition between segregated and liquid phase of BN, when rising pressure, is not known. The existence of SWNT BN is still doubtful. Although two teams reported so [4.2.1 and 4.3.1], proofs are weak. 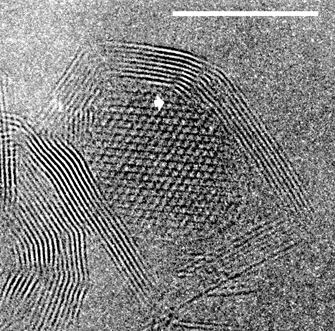 TEM imaging was blurred, inner diameter was 2nm (as for MWNT), neither diffraction or raman was possible (BN is transparent to raman beam). Other teams reported the dominance of double-layered tubes [4.2.6], or of an even number of layer. In thin BN MWNT, arranging of layers by pairs is probable [4.1.3]. This is due to the diatomic character of BN. ominance of achiral helicity is reported [4.1.3], and in some reports dominance of zigzag in particular. For BN, synthesis methods have first been adapted from carbon equivalents, but original methods have also been developed. (BN presents a specific difficulty in that stoichiometry must be achieved between B and N feeders. N is usually fed in excess.) Micron long thin tubes and ropes in macroscopic quantity were obtained mainly by arc discharge method (boron in N2) and by non-ablative laser heating method (h-BN in N2). Arc discharge on a hollow tungsten electrode filled with h-BN [4.2.1] This was the first method to produce thin BN tubes. Tubes are in the order of 200 nm and have a W particle at their extremity. Arc discharge on a HfB2 electrode in N2 [4.2.2] This was the first report of BN SWNT. (Doubtful because characterisation was weak.) Tubes are in the order of 700 nm, and mixed with Hf particles. Quantity produced is not known. Arc discharge on a ZrB2 electrode in N2 [4.2.4] This method is a variant of the previous method, using Zr instead of Hf. Tubes are in the order of 100 nm and mixed with Zr particles. Arc discharge on B electrode in N2 [4.2.6] This method produces a macroscopic quantity of BN double-layered tubes, several micron long. It also produces BN nano-polyhedrons with a boron core. It is the most developed method at present. A laser ablation method for BN has been reported, using an excimer (pulsed) laser on h-BN target, under helium or nitrogen. This produces thin tubes merged to the bulk. Tubes (~ 100 nm on photos) are mixed with Ni or Co, depending on use of catalyst. Quantity is not known, but yield is reported high. Non ablative laser heating (NT grow as a crown around laser impact) [4.1] This method produces extremely long thin tubes thanks to good stability in growing zone. Tubes assemble in ropes. BN nano-polyhedrons with a boron core are also produced. (1100 C) B2H6+NH3+ZrB2 [4.4.1]. The first method reported for BN tubes. It produces large filaments, quite long (~ 10 m) mixed with ZrB2 particles. (1200C) B and Li in a BN crucible in N2 atmosphere [4.4.2]. This is not strictly speaking a synthesis method, but conditions in which some BN tubes (~ 30 nm on photos) where observed growing from the bulk. 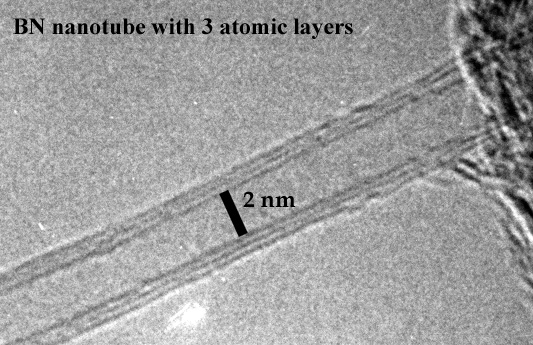 Tubes were found on boron amorphous particles. (1000C) B previously ball milled in NH3 [4.4.3]. This method produced large BN filaments (~ 5 m). Growth on carbon tube templates in oxidising atmosphere [4.6]. This method grows BN tubes from carbon tubes, through an oxidation process. On carbon SWNT ropes, this transformation is reported to be only partial. Plasma jet on a h-BN target in inert atmosphere [4.8] Tubes are presents in powders ejected from the target. They are relatively thick (~ 20 nm) and in the order of 1 micron long. A BN molecule is probably instable at low pressures. Borazine is a liquid analogue to benzene, but different firstly for its polarity. Thanks to B-N polarity, BN molecules solubility is higher than carbon equivalents. Pratically, borazine is mainly used for the formation of boron nitride films (CVD) and as a monomer in polymerisation. Borazine can undergo addition and substitution reactions, especially with Cl. 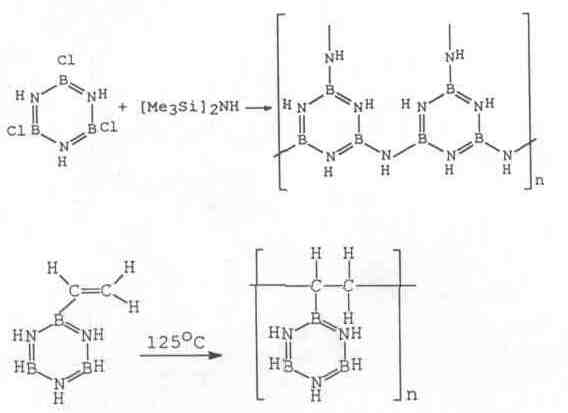 Substituted borazines form polymers upon heating in the range 300-400°C. Example of cross -linking scheme: >B-C1+H-N< -> >B-N< . The pyrolysis of borazine and its polymers causes cross linking up to boron nitride. It needs to be carried out in ammonia atmosphere to obtain pure boron nitride. Stability: Borazine is a flammable liquid. It is decomposed by water (to form H2, NH3 and boric acid), light, heat, alcohols and acids. Decomposition can occur when stored at ambient temperature for period longer than one month. (Negligible when stored below 0oC.) Borazine is stable in dry air but reacts with trace amount of atmospheric moisture. Slow polymerization may occur by light. Safety: Liquid borazine may cause burns to skin, eyes and resp. system. h-BN is already used as a graphite substitute for its higher chemical inertness, especially at high temperature (crucible, …). h-BN is non-reactive to molten metals (Al, Fe, Cu, Zn), molten Si, molten glass, molten salts. h-BN is stable against air oxidation up to 900C. (For comparison, graphite burns from 500°C, MoS2 from 350°C and WS2 from 420°C.) BN is typically an interesting material for high temperature applications. [1.1.5-6] For nano-structures, oxidation actually starts at lower temperatures than for bulk material, because of bounding weaknesses at strong particle curvatures. (Carbon tubes burn for 400°C [6.7.4], and WS2 onions burn at 320°C [2.2].) BN is reactive with fluorine: 2 BN + 3 F2 -> 2BF3 + N2, and fluoric acid BN + 4 HF -> NH4BF4. BN is not reactive with other acids. h-BN is insoluble in standards solvents. (acids, alkalies, benzene, alcohol, acetone,…) However, due to the polarity of the B-N bond, molecular BN is expected more soluble than carbon equivalents. Borazine is readily soluble. Solubility of BN NT has not yet been characterised. h-BN is an electrical resistant counterpart to the semi-metallic graphite. This difference is more or less preserved for nano-tubes. BN SWNT are insulators, with a large band gap (~ 5.5 eV). The resistive character is not affected by the structural specificity of the tube (helicity, defects, multi-layering,…). [4.12.2] By contrast, carbon SWNT are semi-conductors or conductors, depending on helicity and diameter. However, practically, most carbon NT are conductors, because of multi-layering, bundling [6.10], or mixed helicities. h-BN is a non-toxic powder sometime used in cosmetics. It may contain several % of boron oxide, which is mild health nuisance. However, boron oxide is washable by boiling water. Also BN NT often contains boron nanoparticles (probably non toxic). As for carbon NT, toxicity is not yet clear. As a volatile fibrous material, carbon NT may cause damage to lung cells, as it is famously the case of asbestos fibres. Due to the high band gap (5.5 eV), BN (h-BN or NT) only absorb UV and higher energy radiations. It is mostly transparent to visible and IR (absorption on hundreds of microns). As a result, BN NT can not be characterised by raman spectroscopy. On the opposite, the absorption of carbon SWNT depends on the band gap, hence on helicity. If absorbing, both BN and C NT are good polarisers, absorbing light polarised perpendicular to tube axis. Few applications specifically using BN NT have been proposed yet. However, most application proposed for carbon NT are feasible with BN NT. In many of those BN is advantageous. Both carbon and BN meet same practical difficulties. One difficulty is the manipulation of individual structures on the nanometre scale (as required for nano-electronics, for instance). Another difficulty is mass production. A third difficulty is to synthesise selected structures (tube of given length, radius, helicity for instance) or to develop post synthesis techniques for structure segregation. As both carbon [6.12] and BN nano-tubes (1.2 TPa [4.10]) have an exceptional elastic modulus, both can be used in mechanical reinforcement. Ceramic composites with h-BN reinforcement are already intensively studied (ex of matrix: ZrO2, SiC, AlN). Typical problems are: mixing in matrix, dispersion of tubes, matrix/tube interface. For these, BN and carbon should differ. Dispersibility and matrix/tube interface may be influenced by the polarity of BN. In addition, the good chemical inertness of BN, may decrease the aging of the composite. On the other hand, BN NT may be more difficult to functionalise. Thanks to their thinnest, NT enable a filtering with an exceptional flux (because the efficient collision surface is very small in the cross section). They could also enable filtering of nano-particles if the network was ideally densified. For instance, such filter could be applied to filter automobile exhausts. BN and C have same mechanical properties. However BN could be advantageous in some cases. For instance, cleaning a BN filter of carbon particles is easily done by temperature oxidation. Theoretically, NT may produce any form of fibrous material. Thanks to NT exceptional strength, it may provide exceptional resistance to tearing. It would also offer remarkable resistance to temperature. A NT tissue may be similar to a usual ceramic tissue for many properties. However it may also offer interesting differences, in particular for the softness. Study is needed. As for previous filter application, BN fibres can be cleaned from organics by simple temperature oxidation. Industrial age is causing an exponential growth of CO2 concentration in the atmosphere, mainly due to extensive use of fossil energy sources. The “global warming effect” makes research on non-polluting energy sources a priority. Hydrogen is an ideal candidate, because its combustion produces no other release than water. Practically, the main limit to the commercialisation of hydrogen motor is the difficulty for a safe way to store hydrogen. Carbon NT and onions are thought to be a safe storage, because of high H2 trapping capacity. Such storage was measured with variable success, between 0 and 10 wt % in carbon tubes. (See [2.10] for instance.) Such study has not been led with BN NT, although similar H2 trapping properties may be expected. The conductivity of a carbon SWNT depends on diameter and helicity [6.10.4]. Different carbon NT can theoretically form a nano-sized junction, which is a first step toward "nano-electronic". A nano-transistor was realised through the body of a carbon nano-tube. [2.4] However two major difficulties are expected: manipulation on nanometre scale, and synthesising carbon NT with specific structure. BN is complementary to carbon: It is an insulator of large band gap (~ 5eV, like diamond), little dependent on structure. Diverse possibility of hetero-structures, like C/BN or C/Si are studied. (See [2.6], for instance.) It may also be possible to dope BN NT. (Also see table 1.) To produce stoichiometric BN, N element must be in excess in the gas phase. Hence gas or liq with high vapour pressure is necessary. Typical candidates are N2 and NH3. The presence of metal catalyst may not be necessary. Often, boron itself plays as a catalyst. The main problem is to choose the B source. Procedure could be as follow: Mixing of zeolite and boron oxide in boiling water. Drying. (Fitering?) Annealing powder in vacuum near 900C. Flowing NH3. However, it will not be possible to use HF to remove zeolite from BN NT, because of reactivity. Two interesting candidates for a liquid boron source are BCl3 (boil at 13C) and borazine (boil at 55C). (Both have already been used for BN NT production.) We may also use BBr3 (boil at 91C), but it is a health hazard. BCl3 have the advantage to provide only one B atom per molecule (there are also few C atoms in ethanol). As N source, we may use N2 or NH3. Theoretically, it is possible to control the vapor pressure of two species thanks to the double pumping system. The problem is that the reaction may form in the gas phase, uncatalytically. This would likely forms onions rather than NT. We may use nickel boride as catalyst (as reported in literature) to localise the growth on the catalyst. But the formation of nano nickel boride particle is a technical difficulty to solve. Substitution of BN in carbon nano-tube has been studied by a number of authors. Tubes with various concentrations of elements have been obtained. C and BN tend to segregate as different hexagonal planes, rather than being uniformly distributed in one plane. 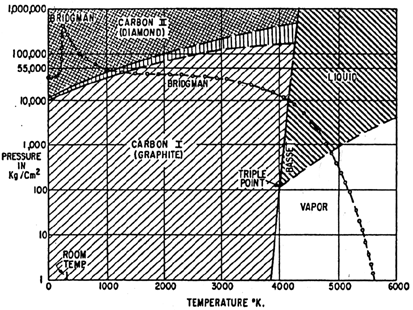 Graphite, Thermophysical Properties of High-Temperature Materials, Vol. 1, 118-121 / 124-131. A. Loiseau, F. Willaime, N. Demoncy, G. Hug, H. Pascard, BN NT with reduced numbers of layers synthesized by arc-discharge , Phys. Rev. Lett. 76, 4737(1996).